Starts at 10am Today until the 11th. 40,000 total available during the promotional period. Pass the love on this Valentine’s Day with a free chocolate heart. Made from smooth milk chocolate and finished with a flourish of pink, this is the perfect occasion to sweeten up your loved one. Want to make the gift even more memorable? 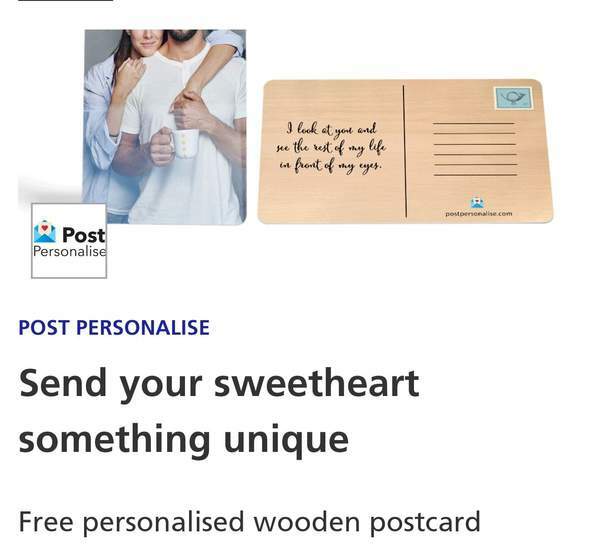 You’ll even be able to ice your own personal message to that special someone. Pick up in-store from your nearest participating Thorntons. 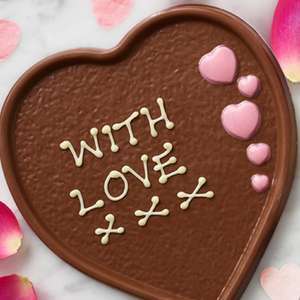 Offer Goods/Services: This Offer entitles you to receive a free Thorntons 100g Valentine’s Day Heart Plaque. The Offer is limited to one 100g Valentine’s Day Heart Plaque per customer. Offer subject to availability. Valid upon presentation of the unique code on your Priority app at the specified store’s till. Offer is only valid in Thorntons standalone retail stores. No screenshots accepted. No sorry I am just about to update, 7th-11th, 40,000 available during the promotional period, they release a certain amount each day. No sorry I am just about to update, 7th-11th, 40,000 available during the …No sorry I am just about to update, 7th-11th, 40,000 available during the promotional period, they release a certain amount each day. Brilliant, thanks for posting and heat added! I might get up early to redeem this, shame the codes will probably be generic (O2 need live background so only 1 heart per visit). I'll try and go to two stores, let's see how it goes! Brilliant, thanks for posting and heat added! I might get up early to …Brilliant, thanks for posting and heat added! I might get up early to redeem this, shame the codes will probably be generic (O2 need live background so only 1 heart per visit). I'll try and go to two stores, let's see how it goes! I was in a store once early in the morning and the store clocks how many people come in and out. It was just my husband and I, he has a work phone on O2 and asked if he could claim on that as well, she said he could if he went out the shop and came back in At least they ask to see the timer count down, technically in the city centre where I live you could run from one store to the next within the time frame but I personally wouldn’t do this. I was in a store once early in the morning and the store clocks how many …I was in a store once early in the morning and the store clocks how many people come in and out. It was just my husband and I, he has a work phone on O2 and asked if he could claim on that as well, she said he could if he went out the shop and came back in At least they ask to see the timer count down, technically in the city centre where I live you could run from one store to the next within the time frame but I personally wouldn’t do this. Half the Thornton's stores near me have closed down. I have more than one O2 SIM so I'd be able to claim more than 1, it's just the fact I'll have to make multiple visits that is annoying given how quickly these go OOS. Half the Thornton's stores near me have closed down. I have more than one …Half the Thornton's stores near me have closed down. I have more than one O2 SIM so I'd be able to claim more than 1, it's just the fact I'll have to make multiple visits that is annoying given how quickly these go OOS. I just did, just saw @rehmanfarid_11's comment and will give credit in OP. I've still got that heart I picked up last year..
Last year I engraved mine with my own name because why not? It was finished within the week! Yaaas, gotta make sure they spell the cakeh correctly with an "h" at the end, so it doesn't get embarrassing when you hand it over to me..
Last year I engraved mine with my own name because why not? It was …Last year I engraved mine with my own name because why not? It was finished within the week! Haha! I never get anything iced on my O2 freebies, some of the staff in my local Thornton's are so grumpy and rude that I just want to get out of there as quick as I can. Sometimes I don't even bother picking up freebies from there because it's not worth ruining my mood for! No, I'm not even sure why I haven't eaten it!? Guess I've had tastier chocs in my drawer that I've craved. It's not even expired yet though, plenty of time to get around to it. Yaaas, gotta make sure they spell the cakeh correctly with an "h" at the …Yaaas, gotta make sure they spell the cakeh correctly with an "h" at the end, so it doesn't get embarrassing when you hand it over to me.. I'll write it down on paper, they'd better not get it wrong or they'll have Shawn to deal with! Haha! I never get anything iced on my O2 freebies, some of the …Haha! I never get anything iced on my O2 freebies, some of the staff in my local Thornton's are so grumpy and rude that I just want to get out of there as quick as I can. Sometimes I don't even bother picking up freebies from there because it's not worth ruining my mood for! My staff are good usually, but not always. They offered to ice it and I said why not? Extra food for free! No, I'm not even sure why I haven't eaten it!? Guess I've had tastier …No, I'm not even sure why I haven't eaten it!? Guess I've had tastier chocs in my drawer that I've craved. It's not even expired yet though, plenty of time to get around to it. ‌ it’s worth a try if you’re brave enough. These codes are usually generic and Thornton's need to see a live code. No, they're not allowed to. Company rules. (I'm ex-staff) . Heat, OP for posting the deal! It’s 100g. Last year they offered a hollow chocolate heart and it was bigger than I was expecting. Hopefully someone will share a pic of theirs soon so you can get an idea of size. It’s 100g. Last year they offered a hollow chocolate heart and it was b …It’s 100g. Last year they offered a hollow chocolate heart and it was bigger than I was expecting. Hopefully someone will share a pic of theirs soon so you can get an idea of size. Doesn’t look hollow to me, it’s a plaque but it won’t be thick. Thanks. The fact they’re 100g didn’t make me think they were big at all. Have you got one? Should've made some crazy cheesy story for your there to enjoy, sorry for my mistake. Should've made some crazy cheesy story for your there to enjoy, sorry for …Should've made some crazy cheesy story for your there to enjoy, sorry for my mistake.